Have you seen these needle threaders? If not, they are must haves for your stitching bag. 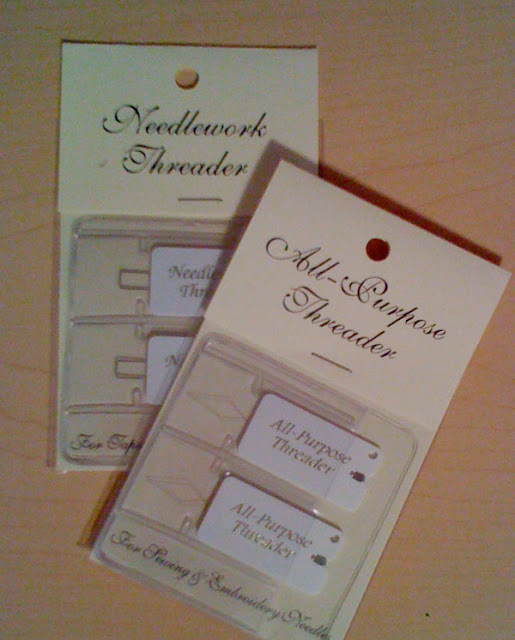 the small shown here for beading needles and little one ply projects. An in between size for most of your silks and flosses or the nifty square tipped threader for yarns. They even come in these cute little storage containers so the wires don’t bend when you aren’t using them. You know I love my organizational gismos! « Previous: It’s an Atomic Christmas! Your question about what would be approved by airport security reminded me of a story of a friend who had her approved cutting tool taken from her. Her sweet husband dashed off and bought her some dental floss. She was at least able to use the small cutting tool include on the end of that packaging for her LONG flight. All that stitching time was not lost!